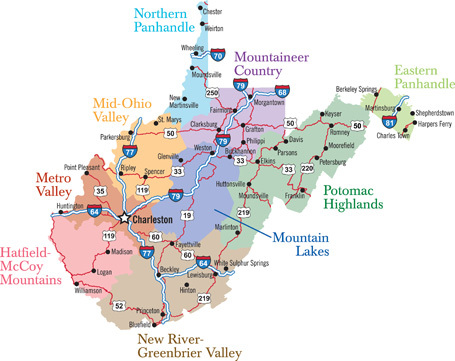 If you are not familar with WV, we have 55 counties. There are a handful of counties that might be known to outsiders--primarily Logan county and McDowell county, but mostly you'll want to figure out what region you are in or visiting to decide where to go. I consider a lot of these areas a day trip from Morgantown (Monongalia county / Mountaineer Country) so don't skip a visit just because it's not in your region. It's going to be a drive to the majority of these places, anyway, so as long as you've got a book or music to listen to, just plan to make a scenic drive part of your day. * These are a relatively easy day drive from Morgantown, ie. generally less than 2 hours OR good roads. In general, if you're coming from the north, a place that is any distance from I79, Rt 19, or off Rt 50 EAST of I79, is going to be a long slow drive, because you're most likely going to be on two-line winding roads with 9% grades. These are lovely drives, but will be frustrating if you are expecting 20 miles to take 20 minutes. Also, don't rely on your phone GPS, especially in the central eastern part of the state. You will NOT have cell signal in the Green Bank Quiet Zone. Also, our GPS frequently attempts to kill us, so if you're directed to take a single lane dirt road--hesitate before doing so, unless you have 4WD. Because I was interested, here is a list of the parks and forest arranged by the year they were established. You'll notice that there were a lot of parks and forest established in the 1930s--that's because of most were CCC (Civilian Conservation Corps) projects. What you'll notice if you visit those places are the CCC cabins and shelters, many of which have a similar look to them.